Omni-channel is a huge buzzword in and around the ecommerce industry. Multi-channel has been prevailing in the market for a pretty long time wherein each channel, be it brick & mortar, ecommerce or mobile are independent of each other. 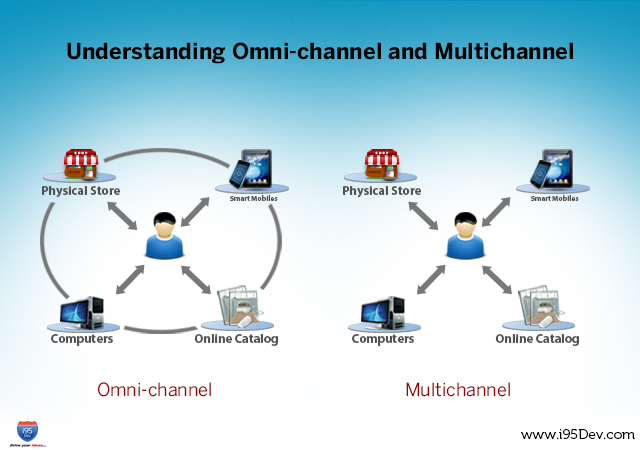 People often perceive multi-channel and Omni-channel as the same but in reality it is not so. Omni-channel enables businesses to provide similar experience across channels for their customers. In Omni-channel retailing, a customer can use more than one sales channel to shop from a retailer for any given transaction. They can buy online and pick up in-store for example, or use mobile in-store to research or make a purchase, or they can buy in-store and initiate a return online. Whichever channel the customer looks upon, Omni-channel will give them the same acquaintance. It empowers businesses in working towards a 360-degree view of its customers’ purchases across all channels whereas in multi-channel they’re just offering customers a selection of channels to choose between. Integration helps to connect various channels and capacitate the desired features across them but whether the business desire to use it or not in an appropriate way is something that depends entirely upon the business’s needs and interests. Since Omni-channel ideally reﬂects a single channel with multiple touch points, it helps businesses achieve synchronization across all channels. Omni-channel presence facilitates businesses to support their customers in a seamless way across all their business functions. The marketing, sales, service, training, product management and supply chain functions works in conjunction as a uniﬁed entity, meeting customers’ demands by providing what they want, when they want, and in the channel that best suits their needs at any given moment. It establishes seamlessness in terms of buying, placement, and promotion of devices, accessories and other merchandise and develops the ability to holistically manage inventory forward, backwards and sideways, and ideally with the ﬂexibility to deliver products to the highest-return opportunities. Integration among all probable systems, front end as well as back end, enables businesses to offer Omni-channel experience to their customers provided the fact that the business uses same information across channels to support the same.